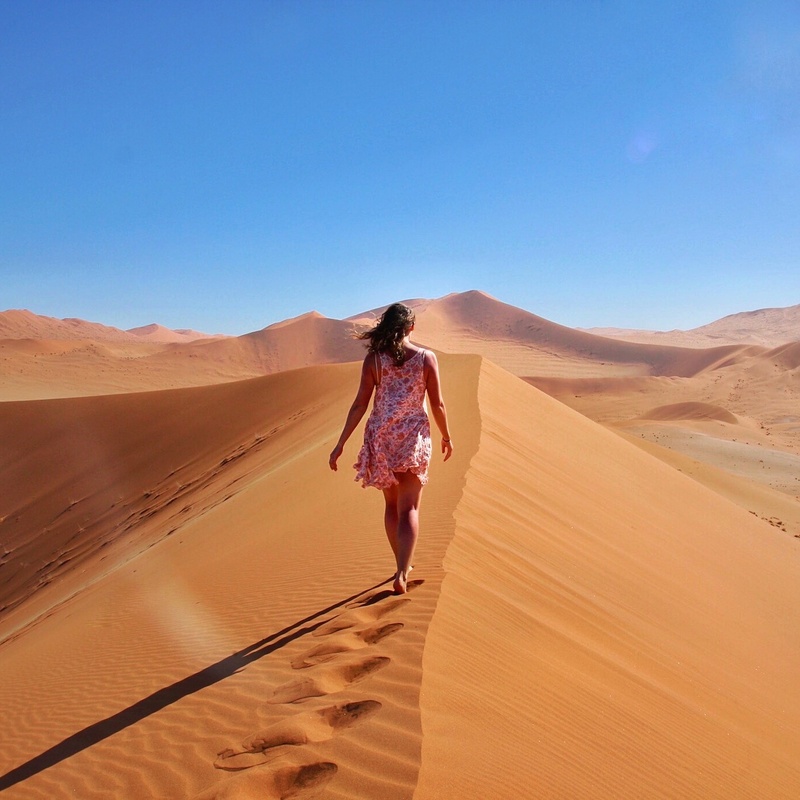 The Namib-Naukluft National Park is home to the oldest desert in the world with some of the largest dunes in the world. The most famous of which is Sossusvlei, the highlight of Namibia and a photographers dream. When I picture Namibia, this is the famous spot that I imagine. The top reason Namibia is such a favorite backpacking and family destination is because of this national park. 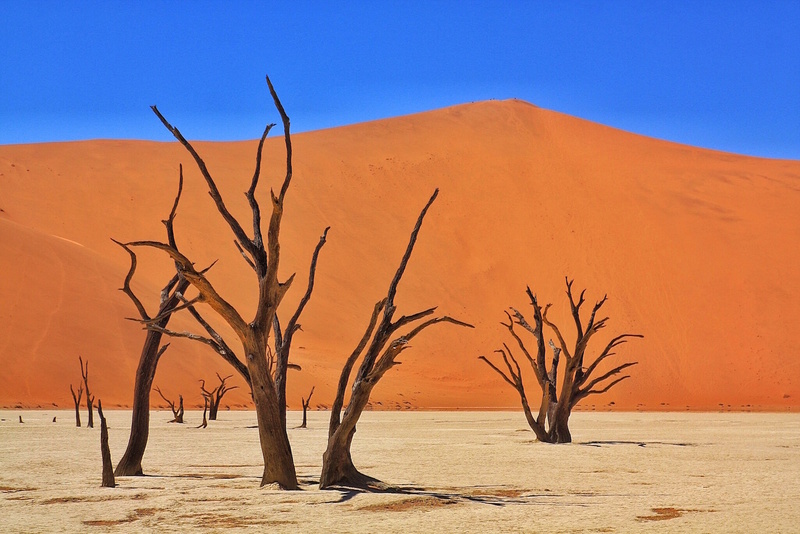 No visit to Namibia could be without a stop to Sossusvlei to marvel at the dead trees and the massive sand dunes. While the park is huge, there is limited accessibility, so only one day is needed to explore everything. Stay the night at the NWR Sesriem Campground or Lodge within the National Park so you are able to see a stunning sunrise followed by the morning exploring Sossusvlei. The park entrance is at the town of Sesriem. From Solitaire, take C19 south to Sesriem. After 70 km, take a right turn on D826 where in 10km you will arrive to Sesriem. It is a 4-hour drive from Windhoek. From Sesriem it is a one hour drive to Sossusvlei. Drive into the park when the 2nd gate opens at 5:45am. We suggest getting to the gate a couple of minutes before it opens so you are early in the que. It is 45 km, roughly 35 minute drive to get to Dune 45. It is well-marked and there is a large parking area. This is the most popular sunrise spot in the park. Hike up the dune for 20 minutes or so until you have a good viewpoint. 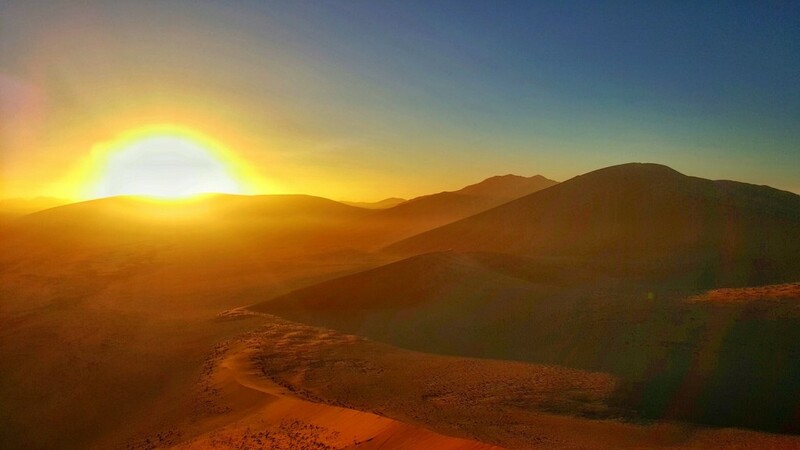 The views are stunning as the sun rises up behind all the rolling sand dunes. Following sunrise, hike down and drive to the last parking area at 64km. From here, 4wd is required to drive the last 4km. Ensure your tire pressure is at the proper levels if continuing on 4wd. Option 1: NWR shuttles drive you around the park as needed, and return you to your car for $180 NAD per person. Option 2: Hitchhike in to Sossusvlei. It took about 7 or 8 vehicles to pass before one stopped to pick us up, and that was because all the other vehicles were full. Walk along the street and someone with room will absolutely stop to drive you in. Hitch a ride back from the Deadvlei parking area. Once at the end, you have two main areas to explore: Sossusvlei and Deadvlei. They are across from each other, both with a pan at the bottom of the dunes which flood after it rains. They look like a salt flat when dry. We suggest getting here as early as possible to beat the mid-day heat and the rest of the tourists. Explore Deadvlei first as it will be the busiest. Next to Deadvlei is the Big Daddy dune. 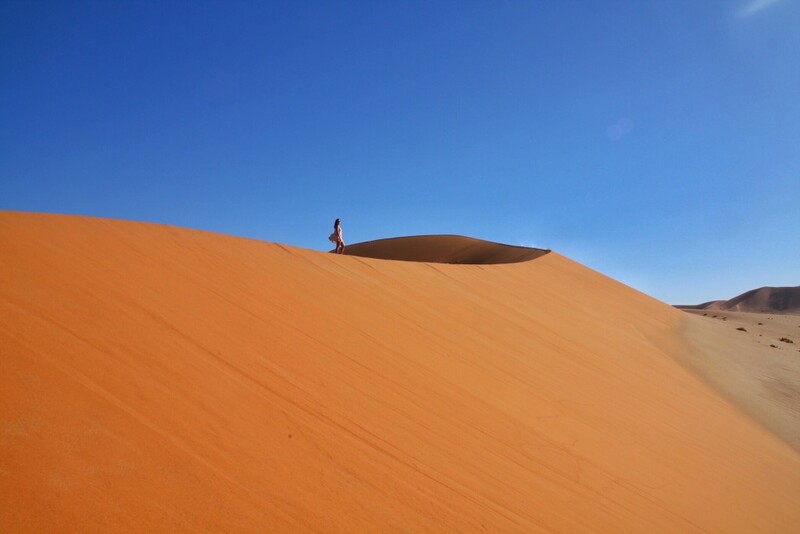 This is the largest sand dune in the national park, and one of the largest in the world. You can hike up it, but it is a tall task and will take at least 45 painful minutes to get to the top. After marveling at the dead trees, head across the street to Sossusvlei. This the other large salt flat that has a great crescent-shaped dune above it. This is one of my favorite dunes to climb and was very picturesque because it curves, so you can really see the size of the dune.